Part of my new research position at the University of Melbourne allows me to be involved in the field work of my colleagues. This is excellent as it enables me to get involved in other projects, gain new skills, learn new species, and see new places. 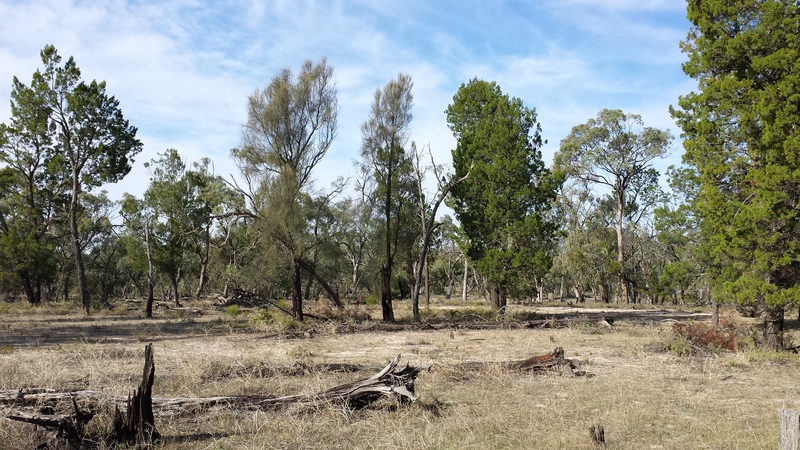 One such project is a kangaroo grazing impact study within Wyperfeld National Park (WNP) in north-west Victoria. 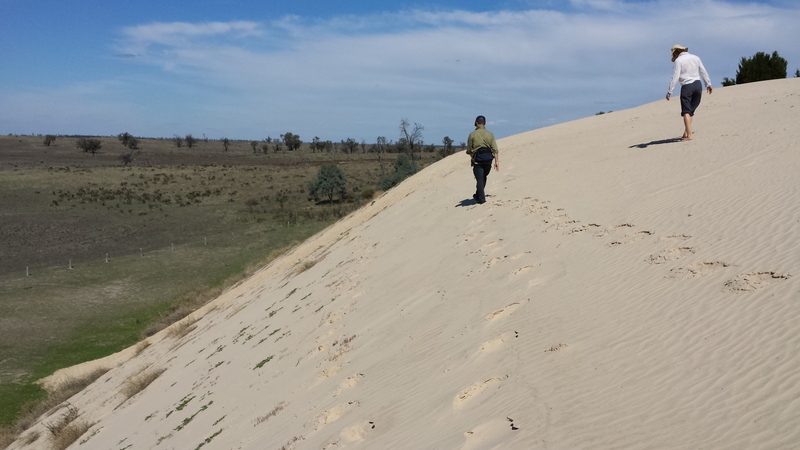 WNP is the third largest park in Victoria (over 3500 km^2) and is part of the Victorian mallee. The study area is an area of Pine-Buloke (Callitris gracilis and Allocasuarina luehmannii) vegetation, which occurs in occasionally flooded parts of the park. Here I’ll discuss a few thoughts on woody regeneration in a new field area for me. A focus of this project is the recruitment of the pine and buloke trees. Wooded areas must have adequate regeneration to retain the long-term canopy structure. 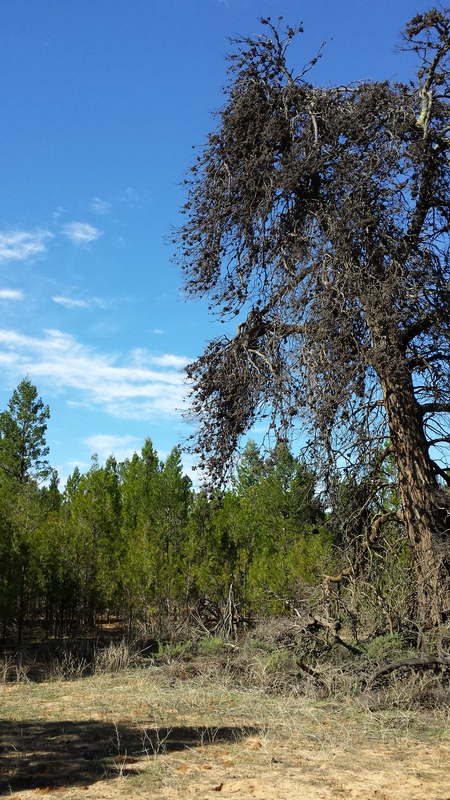 In many areas within this vegetation type, some older trees are dying but there are no young trees to replace them. Bottlenecks to woody plant recruitment can happen in many growth stages e.g. seed or seedling, and for many reasons e.g. grazing, lack of rain, lack of flooding, timber harvesting, etc. Management therefore needs to target this bottleneck(s) appropriately to maximise the benefits. This system is a clear example where woody recruitment is being inhibited, but the direct cause and location of this bottleneck is yet unclear. See the QAECO blog I wrote with José and Cindy for some more info on recruitment in this system. I can’t wait to find out what it is! So you may be aware that I have done a lot of work in the last few years working on dense stands of eucalypts… if not you can refer to here, and here. During the visit to Wyperfeld National Park, we stumbled across a site populated by a handful of very large old Slender Cypress Pines (Callitris gracilis) surrounded by hundreds of saplings. This is exactly the same process as I have described for eucalypts where the site had been cleared, grazed, and following a release of grazing pressure as well as favourable climate, mass seedling recruitment occurred. This is not a surprising observation necessarily, but it is interesting in that it highlights the consistency of this ‘phenomenon’ across space and species, providing those starting conditions are provided. I look forward to some more thinking about all of this. If anyone reads this and knows of examples of the same thing for other species, please let me know. Woody plant regeneration has become a particular interest to me, and I am finding myself doing more and more work in this area. If it allows me to keep exploring and researching such interesting vegetation, in interesting locations, with interesting people, then I will be very happy for it to continue. This entry was posted in Interest, Other Research and tagged Allocasuarina luehmannii, Callitris gracilis, dense stand, kangaroo grazing, mallee, recruitment bottleneck, tree thickets, woody regeneration, Wyperfeld national park. Bookmark the permalink.